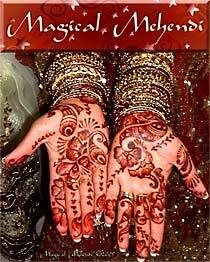 Contact Info To learn more or to book Magical Mehndi for an event, visit their website at www.MagicalMehendi.com. Magical Mehendi is not just another Mehendi company. One would never guess from looking at the authentic and creative Mehendi designs that the owner and artist is not Indian by birth, although certainly Indian at heart. Justine Howland-Goodwin started her Mehendi business in 1998, and has since grown it to the point where appointments are booked months in advance. Justine admits "Yes I am not Indian, but my best friend/adopted family is Indian and I like to joke that I'm not Indian in this lifetime, but I must have been in a past lifetime." Many of her customers are brides, and many learn about her through the numerous festivals and events where she sets up a homely, comfortable booth and patiently decorates the hands of hundreds of people a day. Her love for Mehendi has motivated her to bring awareness of this beautiful art to those non-Indian. It is her mission to spread the word to those who have never heard of Mehndi before.